The Weekend is the Centre’s flagship occasion to raise funds for the Ian Coulson Memorial Postgraduate Award fund, and, as readers of the blog a fortnight ago will have seen, we had three worthy Award winners this September. 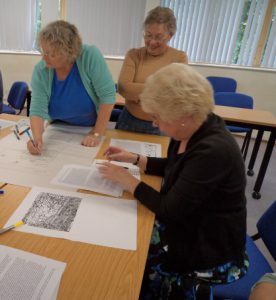 They are working on very diverse and worthwhile research projects from cultural interpretations of prehistoric barrows in Kent to feeding the nation during the Second World War, looking specifically at rural Kent as a case study. In many ways this gives me a nice link to the Garden History day at Canterbury Christ Church yesterday. This was very much a multidisciplinary, even interdisciplinary, undertaking that brought together historians in various guises, geographers and plant biologists. 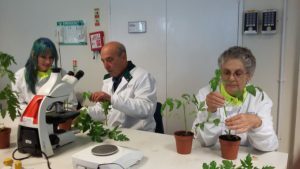 Another important aspect of the day were the hands-on workshops that involved plotting and grafting, but more on that anon. Having signed in at the Reception desk in the care of Mary-jane Pamphilon, participants settled into the Michael Berry Lecture Theatre. 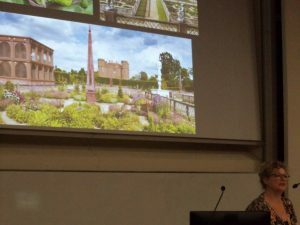 Dr Diane Heath chaired these sessions in the lecture theatre and having welcomed her audience of well over fifty people, she handed the baton (microphone) to Dr Jayne Wackett to give the first talk on garden history from Eden to Tradescant. 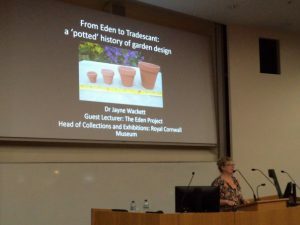 In taking her audience back to Genesis and the Creation narrative, Jayne brought together her involvement as a lecturer at the Eden project and the idea of thinking about just what is a ‘garden’ and is that different from ‘gardens’ in terms of purpose, arrangement etc. The consensus seems to be that there can be considerable overlap but the three key points are utility (food), pleasure (leisure) and as a sacred space. Moreover, this designing the landscape can involve/almost merge into architecture. Beginning with prehistory and moving on through time to the Egyptians, Persians, and Celts, Jayne brought her audience to ‘What the Romans did for us’ and the answer is a great deal regarding the introduction of plant species, gardening techniques, pesticides, portable cold frames, and in many ways the value/importance of gardening whether we are talking about rural villas or town houses. However, for all these very positive points, Jayne did say that they had also been responsible for nettles (ok perhaps?) and ground elder. Moving on to the Middle Ages after the ‘Fall of the Roman Empire’ up to the Tudor period, Jayne discussed gardening in relation to the three estates: those who worked, those who prayed and those who fought. In particular, she commented on monastic gardens, including the growing of medicinal plants such as feverfew and rosemary, and, even though this was important, it was only one aspect of the ‘perfect’ monastic garden. In looking at the gardens of the aristocracy, she explained the hortus conclusus – private enclosed garden, including its allegorical significance in romance literature and spiritual texts. Finally, Jayne introduced the importance of the Renaissance to European garden history, just as it was to the development of other areas of the arts and sciences. For, as she said, looking at Tudor gardens we see ideas of symmetry, formal gardens as galleries, the idea of order as seen from on high. She also mentioned that at Kenilworth Castle they have reconstructed the Elizabethan garden and when she went there what she found interesting was the overwhelming smell of the flowers – a riot of the senses, and that the range of plants used was limited, a nice link to the Tradescants, who as plant hunters, were among those pioneers who greatly extended what was grown in Stuart gardens. After a well-earned refreshment break, the audience split into two groups and those with Dr Alec Forsyth and his assistant Alex Harvey headed for Christ Church’s plant labs to learn about why and how grafting works and then to have a go themselves, either grafting a tomato on to a potato plant or vice versa. At lunchtime there were numerous proud owners of grafted tomato plants, but I joined Jayne in the plotting workshop. 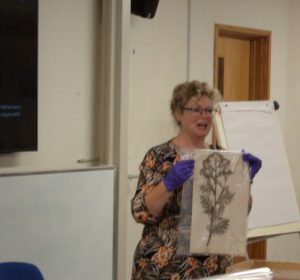 There she showed the audience several specimens from a herbaria – the tansy here, before introducing people to an extract from Francis Bacon on gardening to give them a contextual snapshot when looking at a plan of a late Tudor garden. After some discussion about how such a garden would have been arranged, the participants in groups planned their own late Tudor garden for either a mansion in the countryside or for a town house, labelling the different sections to indicate why they had made their decisions. Everyone joined in and the resulting plans showed just how even within what is a quite formal structure individuality can really make a difference. During the break for lunch, Mat Baldwin, the deputy head garden at Christ Church, conducted two guided tours of the gardens belonging to CCCU at St Martin’s Priory to ensure everyone had an opportunity to visit these very interesting spaces, which are in a Tudor/Stuart style in terms of their planting. This was a useful reminder because John Tradescant the elder had been Lord Wotton’s gardener here at Christ Church in the early 17th century, that is after it had become a minor royal palace following the dissolution of St Augustine’s Abbey in Henry VIII’s reign. 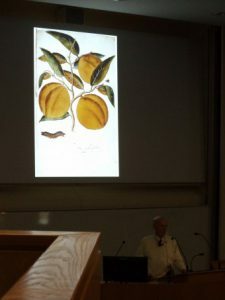 Returning to the main lecture theatre, the audience was treated to a fascinating talk by Dr Barrie Juniper, Reader Emeritus in Plant Sciences at the University of Oxford. 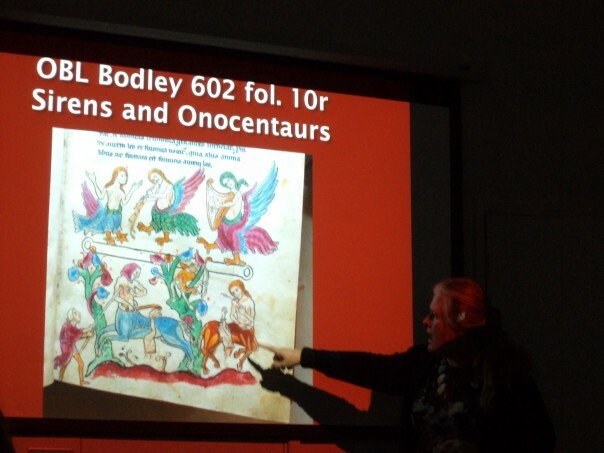 As he said it was part detective story and part thriller as he sought to bring to the audience’s attention what he thinks is the work of John Tradescant the elder’s wife Harriet Pookys Tradescant. He believes she is the artist of the surviving 63 orchard paintings in The Tradescant Orchard. The reason these have survived is that Elias Ashmole in the mid 17th century had managed to get his hands on the Tradescant estate after the death of John the elder, and, even though Harriet had contested the matter, Elias’ ability to buy excellent lawyers gave him the edge and he won through. All of this was very interesting, but it was Barrie’s research into the type of paper used for these watercolours – high quality and probably from Bruges; the similar quality of the pigments etc, also from the Low Countries; the good amateur but not trained and somewhat hurried workmanship of the paintings; as well as the form of the handwriting that all came together when he met Juliet Ralph from the Bodleian Library in 2014. Her suggestion was that this unknown artist was none other than John Tradescant’s wife Harriet. As Barrie said this fitted because Harriet was half Dutch and related to the De Critz and De Neve families, she would have had access to high quality materials from the Low Countries, could easily have had natural talent but as a woman and someone who had to run a very busy household would neither had the opportunity for formal training nor the time to spend very long on each watercolour. However, it may be worth saying that the reason we still have these paintings is that Ashmole did have them bound into a book – held in the Bodleian Library, because before that they seem to have had a fragile past, apparently loose artworks in the Tradescant household where they were fingered by lots of people who left traces of all this handling on the paintings. Moreover, as water colours being in a book has protected them from the light which otherwise would have meant they probably would have faded to nothing, the paper perhaps reused. After all these new insights into the murky world of 17th-century ‘collecting’, and then refreshments, the audience enjoyed a ‘Question and Answer’ session where the expert panel comprised Jayne Wackett, Alec Forsyth, Professor Peter Vujakovic (CCCU, Geography) and Jennifer Potter, an expert on the Tradescants and garden history more broadly. The audience put forward a wide range of questions, and this provided the panel with opportunities to discuss the role of John the elder as Lord Wotton’s gardener, the importance of plant collecting at that time, scientific attitudes towards plant genetics through to today, the value of biodiversity and how bringing disciplines together in the academic field should be encouraged. Drawing that part of the day at Old Sessions to a close, Diane, who had chaired all the lecture theatre sessions, thanked the panel as well as the audience for making it such a good occasion and then led participants down through the campus to the cathedral precincts. However, as with all arrangements, the unexpected can happen and because the precincts had just at that moment come under a security alert, no-one was allowed in. In fact, the group’s two guides, who should have been showing participants 17th-century gardening books in the cathedral library (Karen Brayshaw) and the herbarium (Philip Oostenbrink) were also locked out of the precincts as the place was under a total lockdown. Obviously, this was a great pity, but many felt that they had had a very full day already and had learnt a great deal about gardens, some of which they could apply to their own when they got home. So ended a fascinating day and here at Christ Church it would be great to take the Tradescant link, as well as other aspects of garden history, into future projects. I would have loved to attend this – if only I had known about it ! Hello Brigitte – I’m sorry you didn’t know about this because we would have been delighted if you had come along. 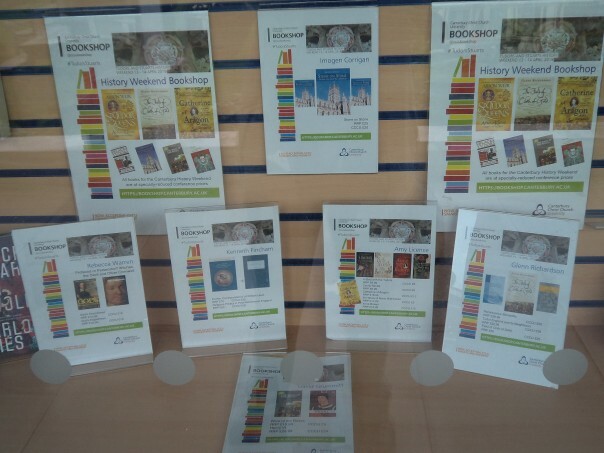 Worth checking the Centre’s ‘Future Events’ page and the blog to see what is coming up.